One of the biggest problems confronting Israel in the creation of an Arab Palestine today is that the Palestine Authority of Fatah has continually fought the battle against Israel by propaganda. The main way they have been doing this is to use TV programs to brainwash and teach their people only what they want them to think. Israel, the 20% left of 100% promised originally by the Mandate, is an accepted international fact , at least by everyone except the Palestinians. Hey, Abbas, we already lost 80% of our promised land. You're not getting these cities that are part of Israel. Israel's population in 2014 is over 8 million with 6,135,000 Jews (75%) and 1,694,000 Arabs (20%). On their show, Palestine This Morning, they are inserting such ideas in between shows with a new filler only started on May 6th that runs every day and is also directed to the children. It's a cutsie way of telling them all that cities in Israel are Palestine cities. They are calling Jerusalem, Haifa, Jaffa, Nazareth, Acre, Negev Desert all cities and places that are theirs. Can anyone see the problems I foresee in the creation of a Palestine with further rights as a state who is calling such erroneous pieces of information to their population? Such a creation of a state should not come about until these Palestinians can accept our history and rights first which must happen in order to have peaceful relations. Otherwise, we're in for continued war. Here's the real facts about such places which are a part of Israel as decided many times through the League of Nations and the United Nations. The fact is that the Jewish Homeland was cut apart and lost 80% of the promised land in 1948 when Jordan took it during Israel's immediate fight for survival after broadcasting the fact that the UN accepted their state. 1. Acre: (Hebrew-Akko) A commercial town started in 15th century (3,514) BCE on a harbor where glass was manufactured. Purple dye also made here. Assigned to the tribe of Asher (one of 12 tribes of Jacob) When Alexander the Great had power there, Greeks populated it so was a Hellenistic city. In 638 Muslims conquered it who persecuted Jewish neighbors and in 66 CE massacred 2,000 Jews. The city declined under the Muslims and was only revived when the Crusaders came in. From 1191 to 1291 it was their capital which then had a Jewish community. In 1740 a Bedouin sheikh Dahir al-Ummar, who reigned in Galilee, made it his capital but he favored Jewish settlement and there was a small settlement there. In 1775 -1804 Ahmed el-Jazzar controlled the city with a Jewish treasurer, Hayyim Farhi. Jazzar was a brutal man. From 1832-1840 Egypt took it under Ibrahim Pasha, and in 1918 it was captured from the Turks by the British. By 1948 it was an Arab town of 12,000. Most left town during the battle for the city. It was in the mandate and granted to the future Jewish Homeland. The population in 1990 was 37,200. Only 8,450 were Arabs. By 2012 the population was 47,200. 2. Haifa: I lived here from 1980 to 1981 for my first 10 months of living in Israel. Appeared after 1st century as the home of Jewish scholars and as the southern limit of the coast on which the purple snail was caught: In 1071 was the seat of the Jerusalem academy; in 1100 Jews defended it against the crusaders. When the sanding up of the Acre harbor and a European colony was established the modern rise of Haifa began from 1850 onwards. 1905 a railway terminus and then the Jewish quarter of Hadar ha-Carmel was established where I shopped many times. 1925 came with the Hebrew Technical College (Technion). The British Mandate saw to the deepening of the harbor was accomplished in 1933. The city was taken over by the Haganah on April 22, 1948 and the Arab population fled. Since then it is Israel's main port. and a center of industrial development. The population was 225,000 in about 1975 and hasn't changed much. By 2012 it was 272,200. It's the base for Israel's ships. It has religious sites like the Cave of Elijah and is the religious center of the Bahai since the tomb of Baha Effendi is there. The University of Haifa opened in 1970. 3. Jaffa: (Hebrew-Yapho) a city joined with Tel Aviv. Mentioned from 16th century BCE Egyptian and Assyrian records, on coastline, it marked the boundary of the Philistines, but a part of the tribal area of Judah (the largest of the 12 tribes from where "Jews" comes from). During the Persian period it belonged to the Phoenicians. During Hellenistic days it was an independent city . Judah the Maccabee avenged massacre of the Jewish community there. Brothers Jonathan and Simon took Jaffa and replaced the foreign population with Jews, then was Jewish port until 70 CE. Main harbor in Roman days-renamed Flavia Ioppe. 1921-1922 Arab riots forced Jews to leave and go to Tel Aviv which was a suburb of Jaffa. By 1946 the population was 101,000 of which 30% were Jews which was 30,300. During War of Independence saw Arab sections capitulate and all Arabs left after May 14, 1948 or before. Jews then populated it. It was joined with Tel Aviv. One quarter has become an artists' colony. The population is counted in with Tel Aviv so that by 2012 they had 414,600 people. 4. Jerusalem: sits in Judean mountains, part of Judah's tribe and capital of Israel. Ancient history goes back to 19th, 18th centuries BCE . Actually lived in early Bronze Age of 3,500 BCE; King David made it his capital, 1010 BCE-970 BCE took it from people who called it Jebus. King Solomon's capital from 970 BCE to 930 BCE. Fell to Babylonians by Nebuchadnezzar in 586 BCE. Jews returned in 519 BCE. Romans destroyed it in 70 CE, named it Aelia Capitolina till Arab period. Arabs call it el-Kuds. Population in 1838 was 11,000 with 3,000 Jews; in 1910 population was 68,000 with 50,000 Jews. During WWI population fell to 50,000. In 1946 population was 165,000 with 100,000 Jews. Arabs rioted in 1922,1929 and again in 1936-1939 spurred on by Sherif of Jerusalem Emir Feisal who was against Abdullah's idea of accepting Jews. In 1967's War east Jerusalem was united with the rest. 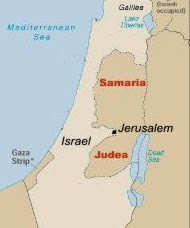 In 1980 The Jerusalem Law had Israel sovereignty over whole city. Population in 2012 was 815,300. 5. Nazareth: town in lower Galilee, 24 miles from Haifa. New Testament has Joseph's family living here and where Jesus grew up as a Jew. It remained a Jewish town until Byzantine times. By 570 a church was built there. It was a center during Crusader times. Destroyed in 1263 by Mameluke leader Baybars. In 1620 Franciscan monks resettled and built a church in 1730. In 1948 it was occupied by Israel forces and has become the headquarters of the Northern district of Israel. It is the principal Arab city in Israel. Population in 1990 was 50,600 with 7,390 Muslims and others who are Christians. Above it is the new Jewish settlement called Upper Nazareth with a population in 1990 of 24,900 including 3,000 Arabs. I had to come here to see about my teaching credentials. By 2012 the population was 74,000. 6. Negev Desert: (Negeb) the very dry land in the southern part of Israel covering 5,138 sq miles or 60% of Israel. In prehistoric days it was settled in the north near Beersheba of Chalcolithic settlements going back 5,000 years BCE. that had copper mines. During the Jewish Patriarchal period there was settlements. A Beersheba-Egypt route was developed then. After the Jewish Exodus, it was occupied by nomadic tribes like the Amalekites (mean tribe) but northern part belonged to the tribe of Simeon (one of 12 tribes of Jacob). It later joined up with tribe of Judah. King David conquered the Amalekites and Edom and opened up Elath and copper mines for Israelites. Under King Solomon, maritime trade started with Phoenician help from Elath to Ophir of southern Arabia. In 70 CE when Jerusalem fell, it was occupied by Nabateans. Arab conquest after 632 CE northern settlements fell apart down to Crusader period. By 1900's the desert was inhabited only by Beduin. Turks finally refounded Beersheba. The British and Turkish armies fought each other here. In the 1947 partition plan it was allotted to the Jewish state. Egypt occupied it in May 1948 except in Jewish areas. War of Independence saw Egypt driven out (Oct 1948-March 1949) . Beersheba is linked to Israel railroads, roads are built to connect to other cities like Elath, Sodom. Oil pipelines go across, built in 1956-1957 and 1968. In 2012 the population of Beersheba was 197,300.